It’s no secret that I love a great dessert. Chocolate, cheesecake, cupcakes, buttercream icing…I could go on for a while here. Chocolate is to me what cookies are to the Cookie Monster. When trying to think of a delicious cookie idea for Easter, I was thinking of all the yummy Easter candy on the shelves right now. 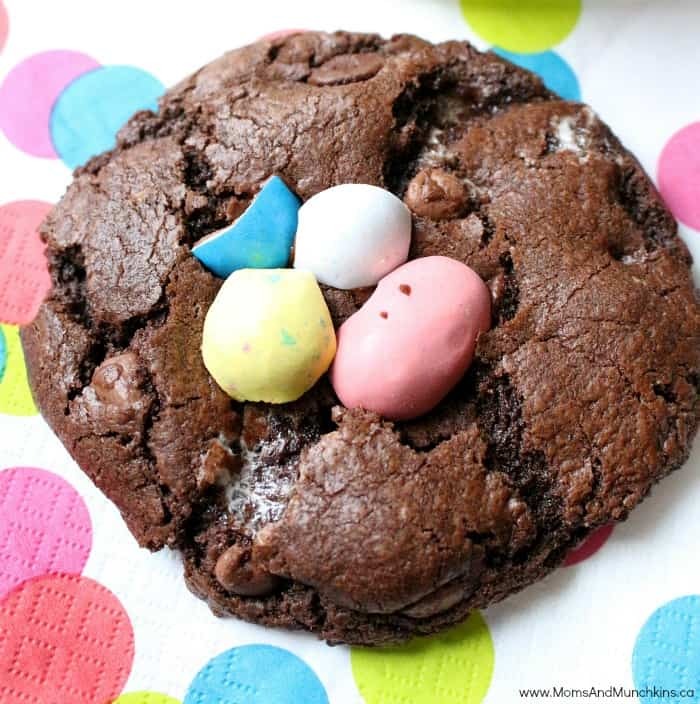 These Triple Chocolate Cookies are loaded with chocolate chips and a secret Easter treat…Peeps! Yes, there are some chopped up Peeps marshmallows baked right into these cookies. Drooling yet? Yes, me too! Let’s get to the recipe! 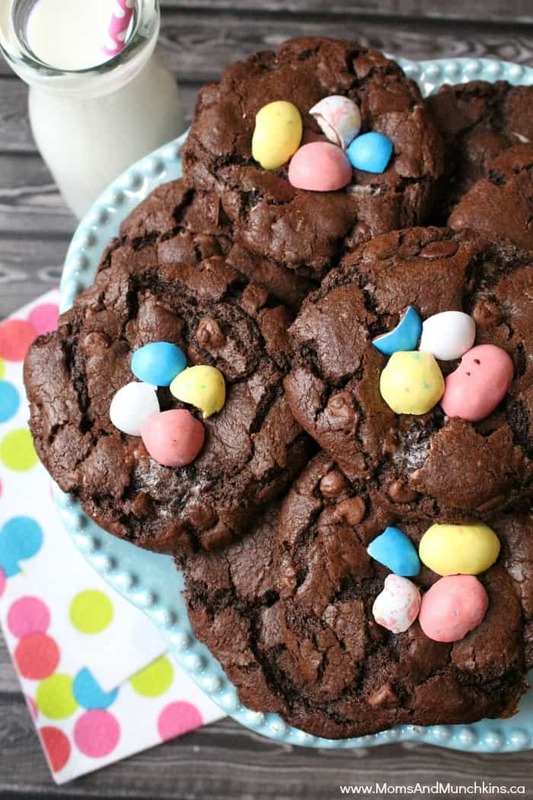 Yes, these cookies are topped with Easter chocolates but this is a recipe that’s perfect for any time of the year! If Easter candy isn’t on the shelves now, use regular mini marshmallows in the cookie dough and top the cookies with crushed pieces of your favorite candy bar. This recipe makes 10 large cookies. In a large bowl, beat butter, white sugar, and brown sugar together until it is a creamy mixture. Add in egg and vanilla and beat until well mixed. In a separate bowl, stir together flour, cocoa powder, baking soda and salt. Slowly add the dry mixture into the wet mixture and beat just until mixed. Add in the chocolate chips and marshmallows and stir until well mixed. Shape dough into large cookies (3 tablespoons size per cookie) and place onto an un-greased cookie sheet. Remove cookies from oven and immediately place crushed Whoppers on top of cookies. Push the candy pieces down slightly but don't squish the cookies. Let cookies cool complete on baking tray before removing them. For more recipes like sweet treats, party food and more, visit our recipes page. Stay updated on the latest by following us on Facebook, Pinterest, Twitter and behind-the-scenes sneak peeks on Instagram.